The correct material is essential if a seal is to be effective, reliable, and long lived. for maximum reliability, including compression set, hardness, tensile and tear strength, abrasion resistance, elongation and modulus. We are very experienced with the use of special materials such as Vespel®, Aflas™ and Kalrez®, as well as other high performance materials. Increasing the time between seal failures will decrease your downtime, adding directly to your bottom line. AflasTM Fluoroelastomer is an alternating copolymer of tetrafluoroethylene and propylene. This combination gives AflasTM Fluoroelastomer unique properties over conventional FKM-type fluoroelastomers such as high resistance to bases and excellent electrical properties. AflasTM Fluoroelastomer also displays outstanding resistance to heat, many solvents, ozone, and steam. Terpolymers of tetrafluoroethylene, propylene, and vinylidene fluoride are also available. Heat Resistance: Mechanical properties of AflasTM do not deteriorate even when used for prolonged exposure to 200°C. It can be used continuously for 2 to 3 months at 230°C and for 10-30 days at 260°C. Oil Resistance: It is resistant to lubricating and hydraulic oils at high temperatures especially today’s high-performance engine oils formulated with amine additives. Steam Resistance: It is unaffected by extended exposure to 200°C steam. Electrical Properties: It has excellent volume resistivity (greater than 1016 ohm-cm) unmatched by other fluoroelastomers. Radiation Resistance: It is stable up to 200 MRad of gamma ray radiation. Solvent Resistance: It offers high resistance to polar solvents such as alcohols and amines. Acid/Alkali Resistance: Parts fabricated from AflasTM compounds perform well upon exposure to many acids and alkalis. Base resistance of AflasTM is substantially better than that of FKM fluoroelastomers. Black in color, Ecorubber 1 is an elastomer basing on acrylonitrile-butadiene rubber which is used for U-rings, chevron packings, special seals and various components. This material has a good resistance to mineral oils and greases and HFA, HFB, and HFC pressure fluids. However, the material is not resistant to glycol-based break fluids, HFD fluids, aromatic fluids (such as benzene), esters, ketones and amines or concentrated acids and bases. Brown in color, Ecorubber 2 is an elastomer based on fluororubber (Viton®) which can be used for U-rings, lip seals, chevron packings, wipers and special seals. Its outstanding properties are high resistance against heat, weathering, ozone and many chemical ingredients. Ecorubber 2 is compatible with mineral oils and greases containing sulfur, HFD pressure fluids (nearly all phosphate esters and chlorinated hydrocarbons), crude oil and sour gas. Ecorubber 2 is not resistant against anhydrous ammonia, amines, ketones, esters, hot water and low molecular weight organic acids. Black in color, Ecorubber 3 is an elastomer based on ethylene-propylene rubber, which can be used for U-seals, lip seals and chevron packings. Ecorubber 3 has an outstanding stability against hot water, steam, washing agents and polar organic solvents. Ecorubber 3 is not resistant against mineral oil and other un-polar media. The stability to weathering, ozone and ageing is good. If it is intended to use Ecorubber 3 in glycol-based brake fluids, national regulations have to be adhered to. Black in color, Ecorubber-H is a hydrogenated or saturated acrylonitrile-butadiene rubber, which is suitable for applications in aliphatic hydrocarbons like propane or butane and mineral oils and greases (for short times up to 170°C) and also for sulfonated crude oil. Furthermore, it can be used in many diluted acids and bases and salt solutions even at elevated temperatures and in glycol-water mixtures. Ecorubber-H is not compatible with fuels with a high content of aromatic hydrocarbons (premium blend petrol), gasoline’s (petrol / alcohol blends) ketones, esters, ethers and chlorinated hydrocarbons like trichloroethylene and tetrachloroethylene. Reddish-brown in color, Ecosil is a silicone rubber, which can be used for O-rings, gaskets and special seals. Owing to the poor mechanical properties, which are noticeably lower in comparison to other rubbers, Ecosil is mostly used for static (non-moving) applications. Ecosil is highly resistant against weathering, ozone and ageing. The compatibility with mineral oils depends on the content of aromatic hydrocarbons in the oil. Temperature range not as wide as of silicone but better oil resistance and resistant to fuels. Combines excellent low-temperature performance of silicone with improved chemical resistance. Very good resistance to military and aerospace fuels. Excellent performance in oxygen plasma environments. Limitations: Avoid polar solvents, hydro-carbon fluids and phosphate ester brake fluids. Susceptible to hydrolysis by acids and bases. Limited abrasion resistance. Typical Uses: Dry Etch, Resist Stripping. Hytrel® thermoplastic polyester elastomers provide the flexibility of rubbers, the strength of plastics, and the processibility of thermoplastics. Hytrel® is also available in a full range of Shore D hardnesses (30D to 82D). Special grades include heat stabilized, flame retardant and blow molding. Concentrates include black pigments, UV protection additives, hydrolysis resistant additives, heat stabilizers and flame retardants. Hytrel® RS Renewably Sourced Thermoplastic Elastomers can help reduce environmental footprint without compromising performance. Grades containing 35% to 65% renewably sourced material show the same performance and processing characteristics of original Hytrel®. Hytrel® is ideal for parts requiring excellent flex fatigue and broad use temperature. It resists tearing, flex-cut growth, creep and abrasion. It offers strength and stiffness plus outstanding toughness while resisting hydrocarbons and many other fluids.Hytrel® can be processed easily by conventional thermoplastic processes, such as injection molding, blow molding, calendaring, rotational molding, extrusion and meltcasting. For demanding sealing applications when customers require the very best, Kalrez® are the elastomer seals of choice. Supplied in standard O-rings or custom shapes, Kalrez® resists over 1,800 different chemicals while offering the high temperature stability of PTFE (327°C). Advanced properties help maintain seal integrity, reduce maintenance and operating costs and improve safety. Kalrez® parts provide reliable, long-term service with a wide range of aggressive industrial and electronic grade chemicals. It is used in highly aggressive chemical processing, semiconductor wafer processing, pharmaceutical, oil and gas recovery, aerospace and petroleum applications. Production facilities for Kalrez® are ISO 9000 and AS 9100 registered. Viton® fluoroelastomer is the most specified fluoroelastomer, well known for its excellent (400°F/200°C) heat resistance. Viton® offers excellent resistance to aggressive fuels and chemicals and has worldwide ISO 9000 and ISO/TS 16949 registration. DuPont™ has developed many types of Viton® to meet specific end-use and processing needs. There are differences between types of Viton® in terms of chemical resistance and mechanical properties. Whether your application is automotive, chemical processing or any number of other industrial applications, there is a particular type of Viton® that best meets your specific performance requirements. The general purpose types differ primarily from the specialty types in chemical resistance. In the specialty family, the choice is among four types that are tailored for superior fluid resistance, low-temperature performance or combinations of these properties. Green in color, Ecopur® is a thermoplastic polyurethane elastomer, which has an unusually high abrasive resistance, low compression set, high physical properties and tear strength. In sealing technology Ecopur® is mostly used for U-rings, lip seals, wipers and chevron packings, but it may also be used for dampers and other machined parts. Products made from this material can be used in mineral oil, in water up to 40°C and in bio- degradable hydraulic oils like vegetable oils and synthetic esters up to 60°C (in these hydraulic fluids its better to use H-Ecopur® instead of Ecopur®). Depending on the seal design and the installation housing seals made of Ecopur can be used up to 400 bar (for higher pressure anti- extrusion-rings are necessary). Red in color, G-Ecopur® is a cast hydrolysis-resistant polyurethane-elastomer with similar properties to H-Ecopur® especially regarding its chemical stability. G-Ecopur can be used in the same hydraulic fluids as H-Ecopur®. Generally, G-Ecopur® is used for seals with a diameter from 540 mm up to 4000 mm. Red in color, H-Ecopur® is a hydrolysis-resistant thermoplastic polyurethane elastomer. It combines the engineering properties of Ecopur® with a high resistance to hydrolysis (hydrolysis is degradation in water) which is otherwise rarely found in polyurethane’s. It is stable in water up to +90°C and has an outstanding stability in mineral oil. Because of its resistance to hydrolysis H-Ecopur® can be used for water hydraulic and for applications in mining, tunneling and manufacturing of presses. H-Ecopur® is particularly recommended for the use in pure and seawater, for HFA and HFB fluids and biologically degradable hydraulic fluids (vegetable oils and synthetic esters) and food articles. H-ECOPUR is KTW approved and meets the FDA standards. This polyurethane is a cast hydrolysis-resistant polyurethane-elastomer with similar properties to G-Ecopur especially regarding its chemical stability. It can be used in the same hydraulic fluids as g-Ecopur. 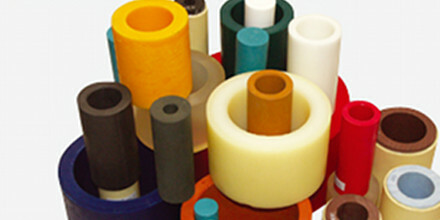 Generally this polyurethane is used for seals with a diameter from 540 mm up to 2000 mm. The new polyurethane brand has been optimized in regard of the tribological characteristics (friction and wear), achieved by an addition of a synergetic combination of solid lubricants. This special material is therefore best suited for most severe applications in the water hydraulics as well as in the oil-free pneumatics. T-Ecopur® is a thermoplastic polyurethane-elastomer, which is modified for deep temperature applications. The properties of T-Ecopur® are similar to those of Ecopur®, but the minimum service temperature is extended to – 50°C. For that reason T-Ecopur® should be used under severe climatic conditions and for applications in freezing plants. Compared to PTFE solutions, X-Ecopur® composite seals show the same material hardness but considerably lower residual deformation and need lower mounting forces. An additional benefit is the resistance to damage on assembly and installation, which can be a major problem with PTFE compounds. Also there is no requirement for sizing or calibrating the seals after assembly. Compared to standard materials harder grades show nearly the same tensile strength and elongation at break at a considerably higher 100% modulus of strain as well as higher tear strength. The tensile set is for instance on the same level as with standard materials. X-Ecopur® versions have higher extrusion resistance than standard materials and therefore allow higher pressure at same geometries. Composite seals made of X-ECOPUR® polyurethanes are an ideal alternative to PTFE solutions, if temperature range and used media do not require PTFE systems. Highest mechanical properties of any plastic above 400°F (204°C). Highest heat deflection temperature 800°F (427°C), with a continuous service capability of 750°F (399°C) in inert environments, or 650°F (343°C) in air with short term exposure potential to 1,000°F (538°C). Lowest coefficient of thermal expansion and highest compressive strength of all unfilled plastics Celazole® is the highest performance engineering thermoplastic available today. It offers the highest heat resistance and mechanical property retention over 400°F of any unfilled plastic. It has better wear resistance and load carrying capabilities at extreme temperatures than any other reinforced or un-reinforced engineering plastic. As an un-reinforced material, Celazole® is very “clean” in terms of ionic impurity and it does not outgas (except water). These characteristics make this material very attractive to semiconductor manufacturers for vacuum chamber applications. Celazole® has excellent ultrasonic transparency which makes it an ideal choice for parts such as probe tip lenses in ultrasonic measuring equipment. Celazole® is also an excellent thermal insulator. Other plastics in melt do not stick to Celazole®. These characteristics make it ideal for contact seals and insulator bushings in plastic production and molding equipment. Unfilled grade offers high purity levels. Duratron® is a fully imidized thermo set polyamides. Full imidization and encapsulation of graphite lubricants in wear grades, make Duratron® PI stronger than other polyamides and provides excellent wear characteristics. Duratron® XP (CM), Polyamides, high purity, unfilled, compression molded Duratron® XP is the first real alternative to traditional polyamides shapes. It was developed for use in extreme applications like high performance values, electronic devices and semiconductor manufacturing process equipment. Un-reinforced Duratron® XP is bright yellow in color and is easy to machine. No special tools or procedures are required. A high purity polyimide, Duratron® XP contains less than 1 ppm of metallic impurities as measured using the ICP-MS test standard. This purity is comparable to other commercially available polyamides shapes. As a result, Duratron® XP is ideal for use in high -energy gas plasma etch and strip processes. Duratron® XP is resistant to most gas plasma formulations used in semiconductor processing and meets or exceeds the performance of other polyamides shapes Duratron® 150 PI, 15% Graphite Filled, Bearing Grade, Compression Molded Polyamide Material is a fully imidized thermo set polyamide. Full imidization and encapsulation of graphite lubricants in wear grades make Duratron® PI stronger than other polyamides and provide excellent wear characteristics. Duratron® PI is synthesized differently than competitive polyamides resulting in improved chemical resistance, lower coefficient of thermal expansion and significantly better physical properties. White in color, Ecoflon 1 is a thermoplastic on the basis of polytetrafluoroethylene that is used for back-up rings, chevron packings, O-rings, rotary seals and gaskets. Ecoflon 1 has the widest application range of all sealing materials. Seals made of Ecoflon 1 will only be attacked by molten alkali metals and elementary Fluor at high temperatures. Using PTFE seals, it should be noted that creeping occurs at relative low loads (pressures). Grey in color, Ecoflon 2 is a polytetrafluoroethylene filled with glass fibers and molybdenum disulphide and can be used for U-rings, glide (slide) rings, anti-extrusion rings, back-ups, for chevron packings and guide rings. Because of its special composition, Ecoflon 2 has good physical properties and distinctly better creep behavior than virgin PTFE. The chemical resistance is similar to virgin PTFE; some ingredients can cause destruction of the fillers. Bronze in color, Ecoflon 3 is a thermoplastic on the basis of polytetrafluoroethylene that is 40% bronze-filled. Black in color, Ecoflon 3 is a thermoplastic on the basis of polytetrafluoroethylene that is 25% carbon-filled. Black in color, Ecomid is a cast polyamide with good sliding properties and is used for back-up rings, guide rings and bearing components instead of Ecotal for a diameters above 260 mm. Ecomid can be used in mineral oils and water-based fire-resistant hydraulic fluids. When designing parts out of Ecomid for an application in water or water-based fluids, the swelling of the material (Ecomid absorbs water up to eight weight percent) must be taken into account. Ecopaek is a polymer with high tensile strength, stiffness, high heat distortion temperature and good sliding and friction behavior. As far as strength and stiffness are concerned, Ultrapeek exceeds most technical plastics especially at high temperatures. Natural white or black in color, Ecope is a UHMW-PE material for guide and back-up elements; very good gliding properties in water; low moisture absorption. Black in color, Ecotal is a semi-crystalline polyacetal-copolymer which is used for anti- extrusion rings, guide ring bushes, scrapers and for precision-machined parts with tight tolerances. Ecotal is one of the most important engineering thermoplastics with good physical properties, low water absorption and good chemical resistance. Ecotal can be used in mineral oils, in water-based fire-resistant hydraulic fluids (HFA, HFB and HFC fluids). Concentrated acids and bases will attack and destroy it. Fluorosint®’s unmatched dimensional stability, excellent creep resistance and white color uniquely position this material to serve FDA regulated applications. It is non-permeable in steam and complies with the FDA’s regulation 21 CFR 175.300. Its relative wear rate is 1/20 the rate of PTFE below 300°F (150°C). Fluorosint®’s unique properties are the result of a proprietary process in which synthetically manufactured mica is chemically linked to PTFE. This bonding results into a load carrying capability and thermal expansion rate not normally attainable in reinforced PTFE. The chemical and temperature resistance inherent in PTFE are practically retained. Fluorosint® 500 has nine times greater resistance to deformation under load than unfilled PTFE (tested according to ASTM D 621; stress of 14 MPa of 50°C). Its coefficient of linear thermal expansion approaches the expansion rate of aluminum and is 1/5 that of virgin PTFE. It is considerably harder than virgin PTFE, has better wear characteristics and maintains low frictional properties. Fluorosint® 500 is also non-abrasive to most mating materials. Fluorosint® 207’s raw material composition used for it’s production is suited for food contact according to the EU/FDA regulations. In combination with a good mechanical performance and an inherent outstanding chemical and hydrolysis resistance, this feature opens numerous application possibilities in food, pharmaceutical and medical industries. Nylatron® is one of the oldest and most widely used engineered mechanical plastics. Its combination of toughness, dimensional stability, wear resistance, availability, and versatility make it a natural choice for engineers looking to improve their project. Nylatron® has performed well in replacing many metals, and offers a design choice where noise reduction and long life are important. Nylatron® is available in natural, black, and blue. Performance improving fillers, depending on the particular application, are also available. Follow the links above for some information on these filled versions. Some key attributes of Nylatron®: Tough, Wear resistant , High heat distortion temperature, Vibration resistant, Easily machined, Dimensional stability, Chemical resistant. Oil Field Applications, Packaging Equipment, Bushings, Bearings, Wear Strips. Nylon is a cast polyamide with good sliding properties and is used for back rings, guide rings and bearing components instead of Ecotal (polyacetal) for a diameter above 260 mm. Nylon can be used in mineral oils and water-based fire-resistant hydraulic fluids. When designing parts out of Nylon for an application in water or water-based fluids, the swelling of the material (Nylon absorbs water up to 8 weight percent) must be taken into account. Grade 1OG/24: A general purpose grade with excellent low smoke and toxicity performance in fire tests. Good insulator for use in Class F temperatures. High mechanical strength. Kite Brand: Excellent electrical insulator with low water absorption and good mechanical strength. Can be hot punched. Machines well. Heron Brand: Characteristics equivalent to Kite Brand but with improved Performance in high humidity or tropical environments. Swan Brand: Good electrical insulator similar to Kite Brand but available in round rod and solid sections only. Machines well. Grade 2P/20: Special warm punching grade available in thin sheet form only. Generally similar to Kite Brand. Grade 1 P/24: Special grade similar to Kite Brand and which also meets flammability Class FV0 requirements with low smoke emission. Grade 1 P/21: Intermediate electrical grade between Kite Brand and Grade 1 P/ 13. Grade 1 P/ 1: Low cost, low voltage material with good all round properties. Machines well. Carp Brand: Fine weave high quality fabric grade. Excellent mechanical strength, low water absorption and good electrical properties. Lynx Brand: Fine weave fabric grade. High mechanical strength, low water absorption and good electrical properties. Machines well. Vole Brand: Medium weave grade with good electrical and mechanical properties. Machines well and is particularly recommended for threaded components. Grade 2F/14: Medium weave grade offering good mechanical strength and improved electrical properties. Whale Brand: Medium weave general purpose grade. Robust and versatile with good electrical and mechanical strength. Bear Brand: Specially developed for use as a bearing material with water and other lubricants. Medium weave with better electrical properties and lower water absorption than Whale Brand. Grade 2F/3/PTFE: Medium weave grade with PTFE uniformly distributed throughout Self-lubricating and ideal for dry bearing applications. Crow Brand: Coarse weave fabric grade giving high impact strength. Good wear characteristics Tough and rugged. Adder Brand: Asbestos fabric grade. Good chemical resistance and mechanical strength. Low to medium electrical properties. Can operate continuously up to 165°C. Grade 4A/23: Uses a finer asbestos fabric than Adder. A special curing process gives improved dimensional stability and wear. Parts may be reproducibly molded to tight tolerances and will maintain dimensional integrity even at elevated temperatures and in hostile chemical environments. Chemical Resistance: Resistant to a wide variety of solvents and corrosive chemicals even at elevated temperatures. Non-Flammability: All Ryton® PPS compounds have UL94 V-0 flammability ratings without flame retardant additives. Torlon® is the highest performing melt processable plastic. It has superior resistance to elevated temperatures. It is capable of performing under severe stress conditions at continuous temperatures to 500°F (260°C). Parts machined from Torlon® stock shapes provide greater compressive strength and higher impact resistance than most advanced engineering plastics. Its extremely low coefficient of linear thermal expansion and high creep resistance deliver excellent dimensional stability over its entire use range. Torlon® is an amorphous material with a Tg (glass transition temperature) of 537°F (280°C). Torlon ® 4301 extruded PAI is primarily used for wear and friction parts. It offers a very low expansion rate, low coefficient of friction and exhibits little or no slip-stick in use. Torlon ® 4301’s flexural modulus of 1,000,000 psi is higher than most other advanced engineering plastics. This grade excels in severe service wear applications such as non- lubricated bearings, seals, bearing cages and reciprocating compressor parts. Because of it’s broad operating temperature range and high melting point (cryogenic temperatures to 550 degrees Fahrenheit), Vespel® is considered one of the highest performing engineering plastics available. For the last 2 decades it has been the choice of manufacturing engineers and maintenance managers who are concerned with reliable equipment and reduced down time. Vespel® parts can be found in automobiles, aircraft, business machines and electric devices, etc. Vespel® parts provide: Wear resistance that can withstand dry pressure velocity values to 300,000 psi-fpm. Broad operating temperature range. Load-carrying capabilities at high temperatures while retaining resistance to creep. Low thermal and electrical conductivity. Machineability without special equipment. There are five compositions of SP polyimide resin Vespel® shapes to choose from: SP-1 is the unfilled base resin which provides the maximum physical strength, elongation and toughness and best electrical and thermal insulation properties. SP-21 has 15% graphite, by weight, added to the base resin for low wear and friction. SP-21 has the most physical strength, elongation and toughness of the graphite filled resins. SP-22 has 40% graphite, by weight, added to the base resin that provides increased resistance to wear and friction and has the lowest coefficient of thermal expansion. SP-211 has 10% Teflon® resin and 15% graphite, by weight, added to the base resin to provide the lowest coefficient of friction over a wide range of operating conditions. SP-3 has 15% molybdenum disulfide, by weight, added to the base resin to provide the best wear and friction resistance in moisture-free and vacuum environments. In these conditions graphite will actually become abrasive. These compositions provide excellent temperature resistance, high wear resistance, dimensional stability, resistance to radiation, extremely low outgassing and relatively ease of machineabilty.